Laboratory grade borosilicate glass can be rapidly heated or cooled without cracking. This guy is great for collecting hydrometer or refractometer samples, weighing hop additions, or mixing water treatments. Nice little beaker for measuring out hops and priming sugar etc. Use this for hope weighing and samples. Works fine. These are so great I bought 3! Used for a variety of tasks: taking gravity readings from brew kettle and fermenters, taking pH readings during mash, measuring for blending. I completely agree with the other review that this is such a handy size beaker for a variety of tasks involved in brewing. I was skeptical at first due to the small size but I actually use this thing quite a bit. Everything from rehydrating dry yeast, cooling wort for SG readings, sampling wort, starch conversion, or even just to freak my neighbors out by drinking beer out of. Grab up a couple while you're at it and take your brewing nerdiness to the next level. I use this and other sized beakers to take gravity readings, for dry yeast hydration, and all kinds of other stuff. Very handy. 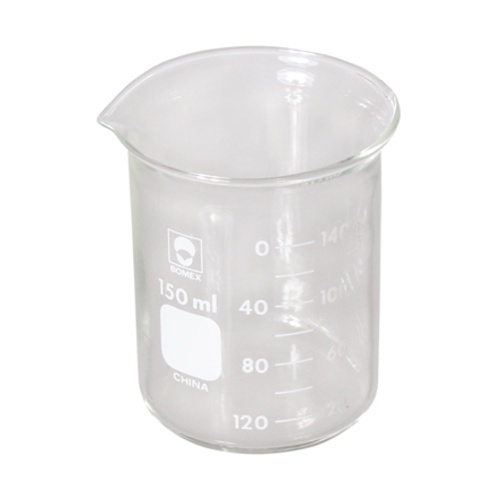 A have a number of these 150mL beakers. I use one for the pH meter to store the probes, another I use for checking the mash conversion, and even for wort samples. Great for checking the pH of the beer from the connical as it small enough to get a sample that shows the progress of the fermentation. it's great for small measurements and it's accurate. little beakers like this come in handy for all sorts of things, and borosilicate glass means you don;t have to worry about it stressing under heat. Can never know when you may need a little beaker for some small measurements. Comes in handy often and solid design. I've also found it useful for rehydrating dried yeast. I have dropped this beaker a few times on my garage's cement floor and the thing is still intact.